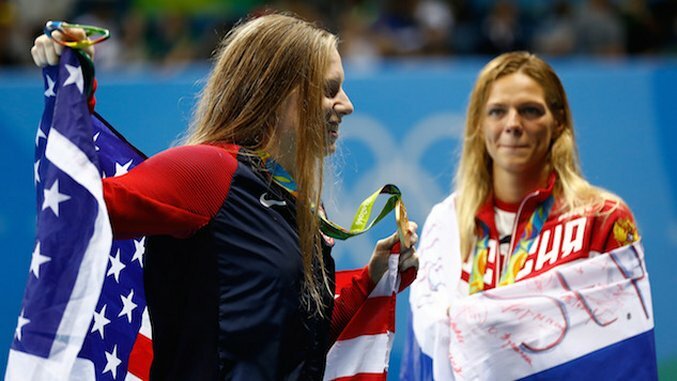 The way TV and Twitter would have it, the second Cold War was settled earlier this week via 100 meters of breaststroke, after American Lilly King called out Russian Yulia Efimova for doping violations and then took the fight to the pool. For the ease of everyone’s narrative, thank God the side of goodness and right and America prevailed. While I appreciate bronze medalist Cody Miller’s enthusiasm, the fact is we don’t actually live in a Rocky movie. And there isn’t actually an easy dramatic resolution to complicated problems like the doping epidemic sweeping through sports. This didn’t strike me, at the time, as a particularly provocative position. Putting aside the fact that filming athletes in the ready room seems like a recipe to end up overanalyzing the actions of adrenaline-filled teenagers, you’re allowed to be or not be a fan of whoever you want. Almost every 19-year-old I know would be happy to tell you exactly who and what they’re not a fan of, and they’d see it as their moral imperative to do so. King followed up, after her win, with, “It’s incredible, just winning a gold medal and knowing I did it clean.” Again, something I thought was a non-controversial position. I’d assume winning a gold medal is incredible. I’d assume most people are in favor of doing so clean. I’d also assume her victory is no more a moral victory than .57 seconds can be a moral referendum on anything. The extent to which these statements were latched on to and heralded as brave truths speaks less to the details of this specific showdown and more to our desire for something to cling to, to believe in, in a sea of distrust and doping. It speaks to our need to tell ourselves this is a problem with them, not with us. Almost 120 Russian athletes were ultimately banned from Rio, following an investigation that found systemic and statesponsored doping in Russia. All the track and field athletes were banned. Then it was recommended that the ban extend to all the athletes in all sports. Then it was decided each sport would implement bans on a case-by-case basis. Some sports issued across-the-board bans; some didn’t. In that back and forth, Efimova only found out she’d been given the go-ahead the night before her swim. She was one of three Russian swimmers quietly exempted from their initial bans. She lives and trains in L.A., making it hard to argue that she’s part of the staterun system in Russia. Her 16month doping ban was for something she bought at an American GNC and that she (sure, allegedly) thought was clean. Going to GNC is stupid generally speaking, but especially stupid for elite athletes who don’t speak great English. It is, however, not intentionally malicious. In March, she tested positive for meldonium, the heart drug that Maria Sharapova was busted for earlier this year. Meldonium was banned as of Jan. 1, and so testing positive in March would be a clear doping violation after that deadline. But. But the World AntiDoping Agency actually didn’t know enough about how long the drug would stay in a person’s system. And so it had to void a number of positive tests in light of the possibility that athletes like Efimova did stop taking it before the Jan. 1 date and were simply testing positive for old remnants of the drug. As a result, she met the criteria to be allowed to compete. You can see these things as excuses for her bad behavior, but these are the facts. Just as it is a fact that athletes have rights to due process. Just as it is a fact that if someone meets the criteria to be allowed to compete, you cannot stop them from doing so. Just as it is a fact that every single athlete at the Olympics, Russian or American, is doing everything they can to be their best. They are doing so because you want them to, because you have demanded it as part of the spectacle. You have demanded that they walk the line, but never cross it. When everything starts to seem gray, we search for anything that looks black and white. King said what she thought, later calling for lifetime bans for dopers and stricter policing, and she’s not the only one who thinks it. Phelps jumped on the King bandwagon, so did Australian Mack Horton. We want so badly for sports to be a pure pursuit, and our faith has been so deeply eroded of late. And so we were ready to take whatever heroes we were given and cast as a villain whoever was served up. Tonight Efimova will compete in the 200m breaststroke. King, whose best event is the 100m, didn’t make the final. But this isn’t really a movie and there isn’t a simple ending. That King won’t beat Efimova in the 200m says no more about the morality of either than her victory in the 100m did. If you want to believe in America, then believe in the rights of the accused, in presumed innocence. Believe that we will not succumb to distrust and cynicism. Believe in empathy. Believe that all these athletes are just people too, good, bad, and flawed – because if they’re not then none of this is worth watching anyway.